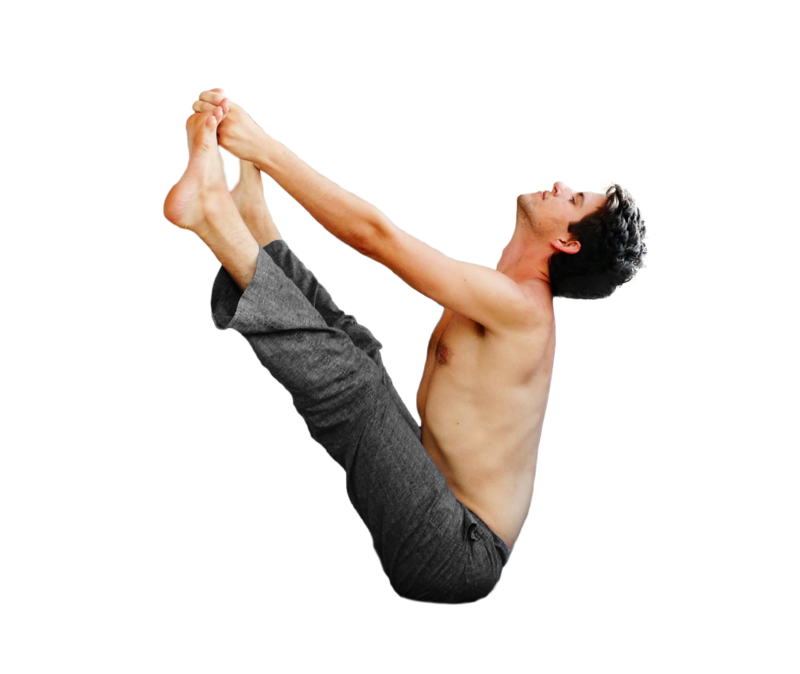 Upavistha Konasana B is the twenty-sixth pose of the primary series, and the twenty-first seated pose. It focuses more on balance than flexibility, and on integration of the limbs. Most of the effort is concentrated in the hip flexors and low belly. This asana takes Upavistha Konasana A and adds the element of balance, requiring additional muscular stability. This is an excellent counterpoint to ‘A’ variation as it teaches the proper action of the legs and spine. That feeling of work should be brought into ‘A’ variation rather than simply ‘stretching’ or sagging forward. The arms are straight, pulling on the feet. The feet are pressing away from the hands vigorously. This interplay between the limbs creates lift and space in the torso, allowing the spine to be straight and the point of balance to be between the sitting bones and tailbone. The head is back and gaze is down the length of the nose. Some practitioners have relatively short limbs, allowing them to lift directly into the posture without letting go of the feet. Those with average/longer limbs will need to release their hold on the feet before lifting up. This pose is entered directly from Upavistha Konasana A.
Inhale, release the grip on the feet, sit upright, and raise the hands to shoulder height. Bring the feet to the hands, and balance. This is the state of the asana; five breaths. Exhale, maintaining your grip on the feet rock forward and land lightly on your calves. Fold forward fully. This asana should feel upright, open, and poised. Do not let the back be deeply rounded. If you feel as though you’re sinking or struggling to sit upright, this is usually due to short or disengaged muscles. If stiffness is the problem: spend more time in the previous postures. If you’re in a led class environment, try bending the knees. If you’re simply slouching through this pose: wake up! Cultivate the strength of your limbs, bandha, and breath.